We all wear shoes. Red shoes or black shoes, running shoes or flat shoes, small heels or tall heels: although the shoe type and function may vary, they often suit the environment in which they are worn. Each shoe provides great insight into the culture in which it originated. 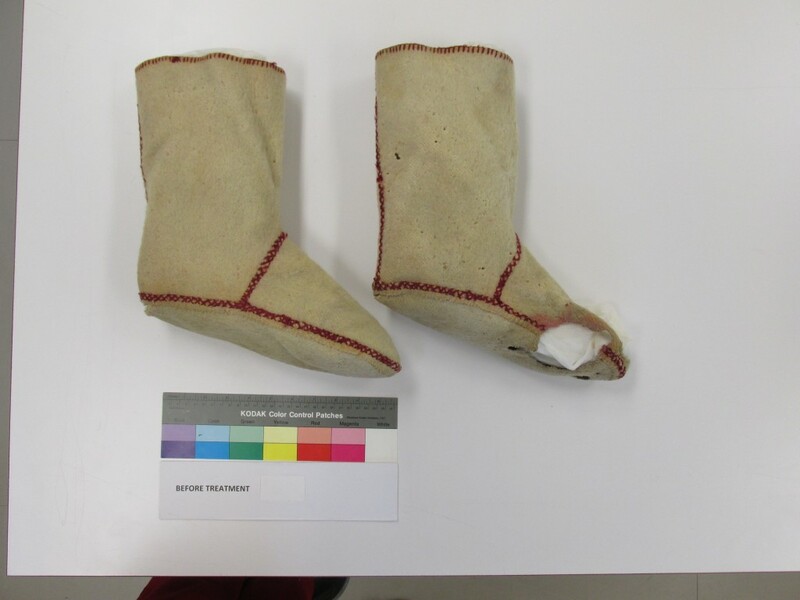 As a current student of the MPhil Textile Conservation program at the University of Glasgow, I was granted the opportunity to intern in the Textile Conservation Laboratory at the Canadian Museum of History under the direction of Caterina Florio for the past 12 weeks. 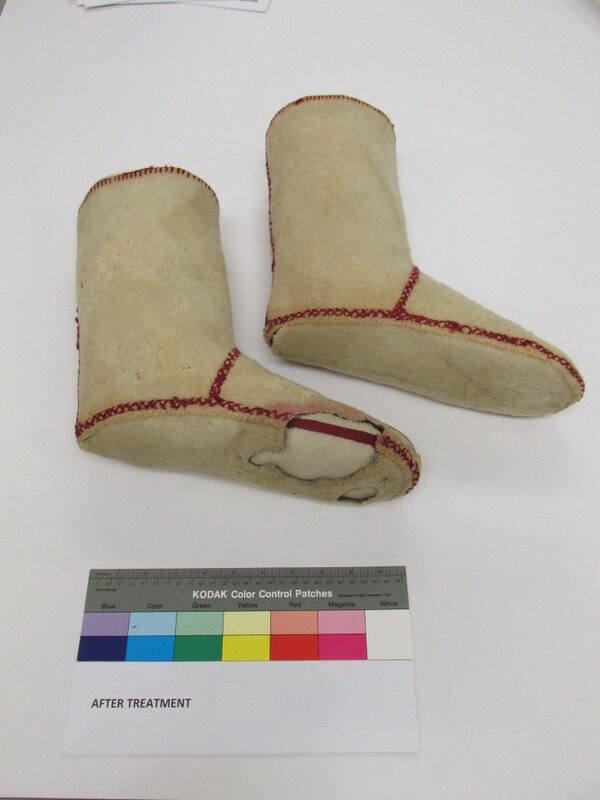 During this time, one of the most intriguing and complex artifacts that I had the opportunity to conserve was a newly acquired pair of mukluk liners, from Fort McPherson in the Northwest Territories, that were in need of treatment before being placed in storage. 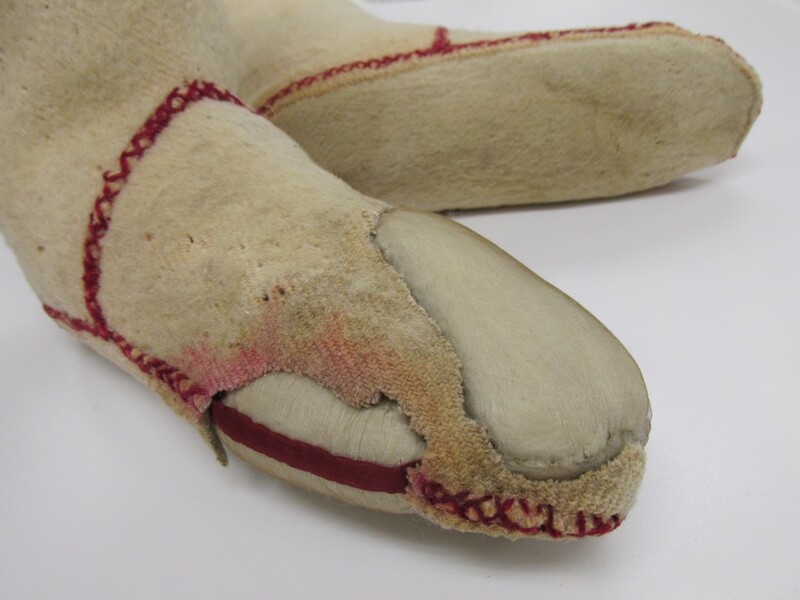 As conservators, often working closely with curators, we help keep objects from deteriorating so future generations may enjoy them. We also try to complete this task using materials and techniques that are reversible and do not change the unique story each object tells. 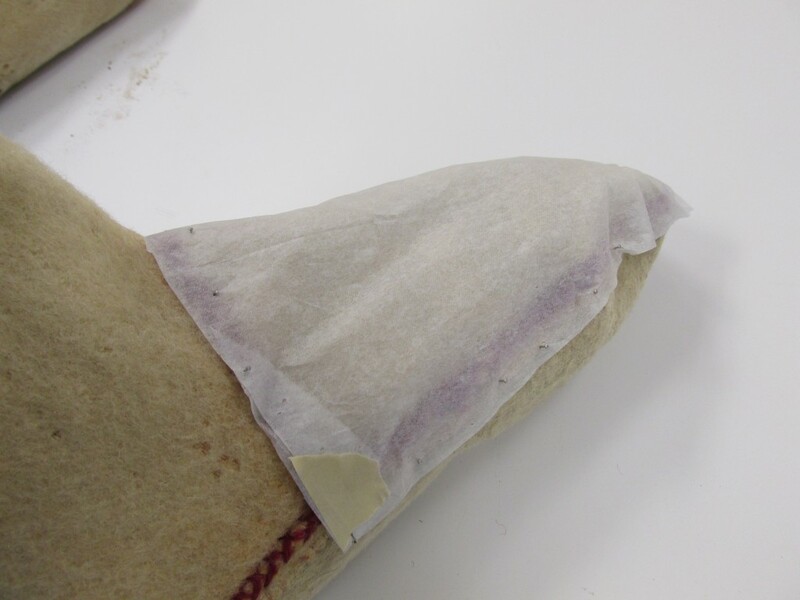 This conservation treatment started with gentle dry surface cleaning and adding moisture to the liners by placing them in a controlled humid environment, helping the fibers to regain more flexibility and strength. Next, the fun part of being a conservator began. As each object is unique, it is a challenge to find new and innovative ways of providing physical support. For the mukluk liners, we determined that two padded inserts with the same construction as the liners would provide the necessary form and make the entire treatment reversible, while still helping to maintain the original shape of the liners. Working backwards to create a pattern seemed like a relatively straightforward task. Several sources in the literature indicated it would be a simple process of tracing the outline of the object and adding in darts or other common techniques used when fabricating clothing. However, when stitching the inserts together, I found it was not quite as simple as I was led to believe. Instead, it took several attempts to create the exact shape and structure of the liners — six separate attempts, to be exact! The next stage of the treatment was to create several patches to fill the large holes and visually complete the look of the liners. The goal was to help minimize the appearance of the holes when looking at the object as a whole. Only upon closer study would the conservation work become apparent. The solution? 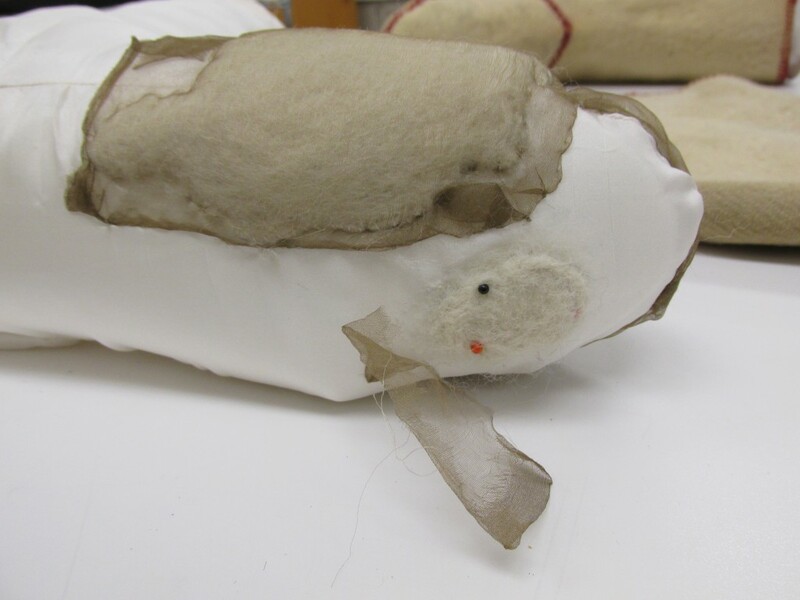 Creating a needle-felted patch that would sit inside the hole and finding the correct colour match based on the current appearance of the mukluk liners. This was not only challenging but also a great opportunity to experiment with various types of materials, including different wools and silks. The final step of the treatment was to add a band of silk between two sections of the red embroidery to help complete the overall look and feel of the liners. 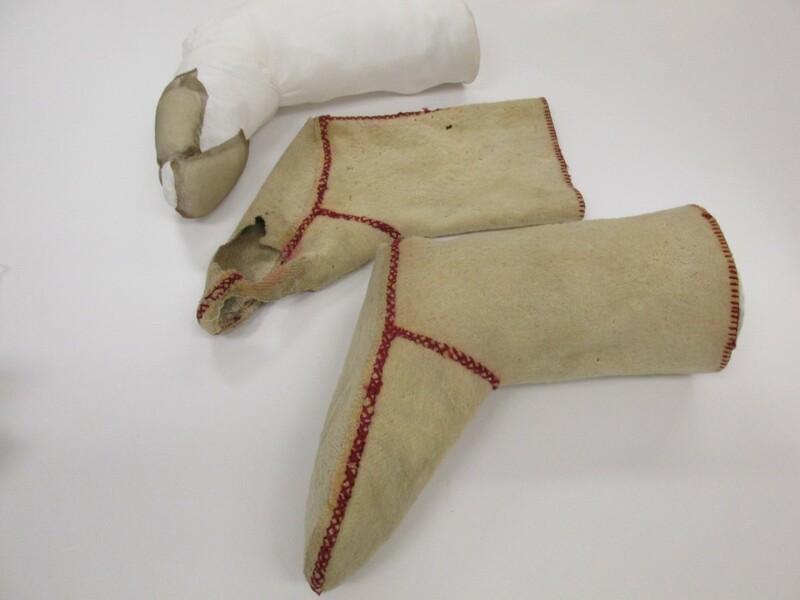 Although the mukluk liners are only one of many types of artifacts that come through the Textile Conservation Laboratory at the Canadian Museum of History, the end goals of long-term preservation and stabilization are always the same.